The loss of a major tax credit worth $28 million in cash last year could hurt in 2017. Over the past couple of years, Clean Energy Fuels Corp (NASDAQ:CLNE) has issued a lot of cheap stock to pay down debt and raise cash. Heading into 2017, there's an argument that the company was in a pretty decent position to turn cash-flow positive. This would be particularly true if fuel volume sales continue to grow, as they have for years, even through the energy downturn. But at the same time, there remain risks, as the company still needs to show that it can steadily and regularly produce profitable cash flows for a sustained period of time. Factor in a recent asset sale that raised $155 million in cash to reduce debt, but will have a negative impact on gross margins going forward, and there's uncertainty about the company's ability to make a profit. What's the biggest risk to the company in 2017? It could be the loss of the volumetric excise tax credit, also called VETC, which was worth $28 million in cash to the company in 2016. Let's take a closer look at this risk, and what to expect. In short, it's a tax credit worth $0.50 per gasoline gallon equivalent of compressed natural gas, or diesel gallon equivalent of liquefied natural gas, and Clean Energy has been able to claim this tax credit for a portion of its fuel sales each year. This credit exceeds the current gas and diesel excise tax of $0.184 and $0.244, respectively, per gallon. In short, this tax credit had been used as an incentive for fleet operators to adopt natural gas vehicles, as it helped offset the incremental cost of a natural gas vehicle versus a similar gas- or diesel-powered version. This tax credit generally belonged to the fuel user, but Clean Energy has been able to claim around $25 million-$28 million in annual VETC credits in recent years. VETC expired at the end of 2016 with a lack of legislative momentum in the "lame duck" period at the end of Barack Obama's second term. Since the inauguration of President Trump, there has been little action on getting VETC, or any of the other so-called "tax extenders" group of credits, extended. Will Congress and the Trump administration pick it up soon? There's some possibility, with congressional leaders and the President saying that they're ready to move on to tax reform. Unfortunately, it's far from clear if there will be enough common ground between congressional budget hawks and more moderate Republicans to get a deal done. Chances are, VETC and every other expired tax incentive won't move forward unless there's a bigger reform effort, or until it becomes clear that won't happen. And frankly, after the Obamacare "repeal and replace" debacle, there's no telling what will happen. CLNE Cash from Operations (Annual) data by YCharts. 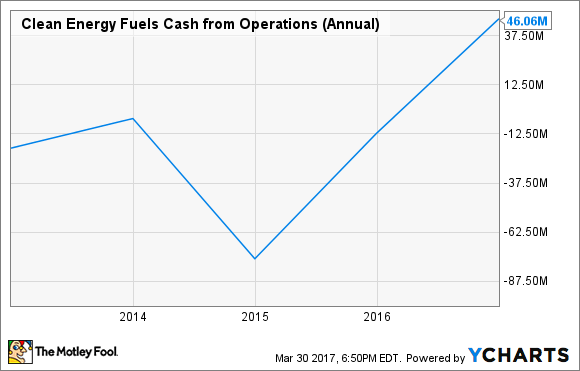 As the chart shows, Clean Energy saw its operating cash flows plummet in 2014, though not entirely due to the expiration of VETC. However, its reinstatement near the end of the year played a substantial role in 2015 cash-flow growth, as the company received two year's worth of VETC revenue. How will this affect Clean Energy in 2017? With VETC expired and no clear political path forward, investors should probably assume the worst -- that this tax credit may not come back for some time, if ever. And that likely means at least $28 million in reduced cash flows this year. The good news is the company is probably much better able to deal with that loss than it was even a few years ago. In recent years, Clean Energy has steadily cut costs and paid off lots of debt. Two line items -- selling, general, and administrative expenses (SG&A) and interest expense -- are on track to be as much as $55 million lower in 2017 than they were in 2014, for example, while capital expenditures will be down by $60 million from that year. Fuel volumes also continue to grow, and the company is set to build and sell the most stations to its customers this year than ever. Gains in these areas should help offset the loss of VETC revenue. Will the cost cuts and the sales growth be enough to offset the loss of VETC? It's not completely clear that it will, but that doesn't mean the company can't survive without this program. Clean Energy's balance sheet is much stronger now than it's been in years, with far less debt and enough cash on hand to bridge the gap, if necessary, while fuel volumes continue to grow on steady, if slow, adoption of natural gas vehicles. Bottom line: Losing VETC will be a big blow to cash flows, but it seems unlikely that this will cause the company any lasting or permanent problems.